Republicans have seen some small signs of optimism lately, after months of a dour outlook. President Trump’s approval ratings have ticked up; Democrats’ once double digit advantage on the question of who people prefer to control Congress has tightened; the economy is improving; unemployment is low; and the GOP believes Americans are finally starting to feel the benefits of their tax cuts. Still, even with those new glimmers of hope, most Republican strategists say their chances of keeping the House are 50-50, at best. That’s because of history and other fundamentals. Enthusiasm is on Democrats’ side. They have over-performed in special elections, seen heavy turnout in primaries, recruited strong candidates, and raised a good amount of money. Plus, women are winning many of the Democratic primaries, something the party hopes will drive voters to the polls in an effort to send a message to President Trump. In fact, Republicans privately concede that about half of those might well be out of Republicans’ reach already. That’s because many of these districts are either areas that Hillary Clinton won, or the 2016 result was so close that these Republicans decided it was better to walk away, rather than wage the kind of fight necessary to retain their seats. Places to watch, for example: in Miami, Clinton won Republican Ileana Ros-Lehtinen’s district by nearly 20 points; in New Jersey, longtime Rep. Rodney Frelinghuysen’s North Jersey district went for Trump by just a point, and in South Jersey, Trump won Frank LoBiondo’s district by less than 5. Court-ordered redistricting in Pennsylvania will also likely cut into the GOP majority. 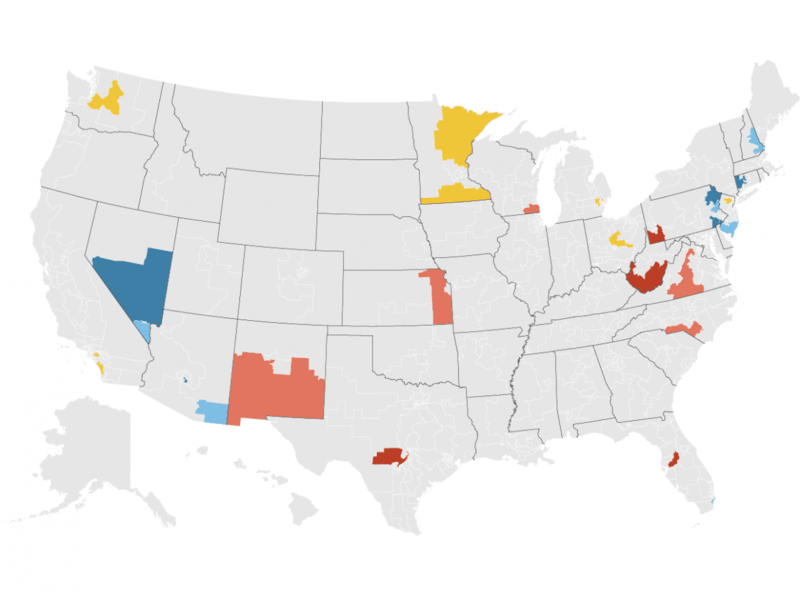 Two Pennsylvania seats – the 6th and 7th congressional districts — are already now favored to move into Democrats’ column. In both places, the districts were redrawn to include territory that Clinton would have won, and the Republican representatives in them have resigned or will retire. Whether these Republicans survive again will depend on the size of a Democratic wave. No matter how well they run their campaigns, they likely wouldn’t make it through a political tsunami. Democrats say their polling shows challengers running well against some of these incumbents. The type of seats that GOP operatives are most worried about are in the suburbs, and they’re largely vulnerable because of Trump. These are affluent areas are full of highly educated voters, frustrated with Trump’s approach to politics. Even if these voters may like their own member of Congress, Republican operatives fear they could take it out on the party in the 2018 midterms as a way to register their dissatisfaction with the president. Orange County, Calif., is one place where this theory will be tested — but there’s a twist. Democrats first have to get their candidates through California’s top-two primary and avoid getting locked out of very winnable races. It’s possible that, because there are so many Democrats running, that they split the vote and two Republicans advance to the general election in a couple key races. Democrats are also looking slightly further down I-95 in the Richmond suburbs at the district held by Rep. Dave Brat. Brat shocked the political world in 2014 when he knocked off then-Majority Leader Eric Cantor in the GOP primary. Since then, the area’s demographics have been rapidly changing. Trump won the district by less than 6 points. In Texas, watch suburban Houston and Dallas. Clinton carried GOP Rep. John Culberson’s district outside Houston, as well as Pete Sessions’ Dallas-area seat. 4. Can the GOP mitigate losses by going on offense to win “Trump Democrats”? The most important state to watch is Minnesota. The open seats of Democrats Tim Walz, who’s running for governor, and the retiring Rick Nolan are prime GOP targets. Trump carried their districts by double digits in 2016.